Hello fellow art lovers! It’s Monday, and you know what that means! 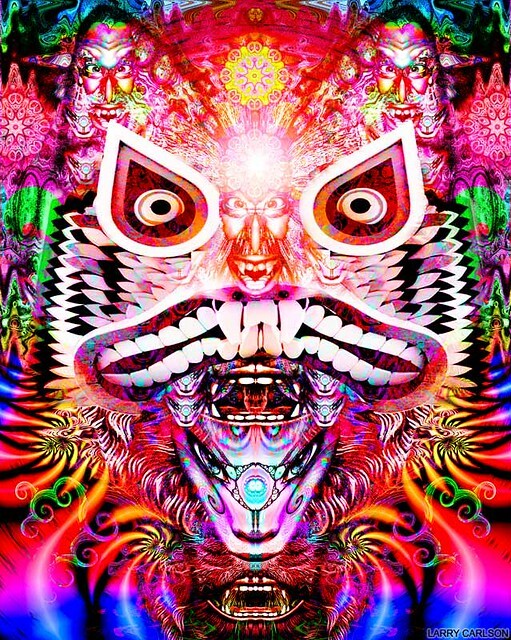 Yes, it’s time for us take a look at some more trippy artwork. Now, let’s dive into the amazing world of Larry Carlson! This is my first time seeing this awesome piece, and my god, it’s glorious! Your eyes are immediately bombarded with an overwhelming display of vibrant colors and shapes. Starting from the painting’s top, we see brilliants wisps of blue and green that stick out like eldritch fire. The titular Werewolf is also quite a fantastic site. His ears appear to have two extremely grotesque demons that give off a very ominous vibe. They’re a brilliant blend of reds, pinks, greens, and yellows. A demon actually makes up the canine’s nose, and its eyes seem to follow your every move. The beast’s eyes are giant teardrops that gaze into the viewer’s soul. Then, we get to his mouth, and what awaits us is true fear! His giant maw is filled with ultra-sharp teeth, and an expression that emanates chaotic malice. He actually has a secondary mouth, that’s located just below his first. The bottom of the piece finishes the job with an awesome explosion of rainbow energy. Tell me what you think of this piece in the comments’ section below. This hypnotic work is definitely one for the record books. At first, all you see is a multicolored spiral of awesome patterns and shapes. However, if you look even closer, you can make out faces and other creatures within the vortex. The faces are extremely similar, if not taken directly from a Junji Ito manga. Ito is known by many as the “King of Horror Manga”, and his stories even give me the shivers. He has the uncanny ability to make everyday objects look downright horrific. They all portray looks of pure horror that make the viewer’s hair stand on end. This is especially seen with the skeletal men with Glasgow smiles. It almost seems as if Carlson has portrayed what LSD Hell would look like. We also see some agonizing maws hidden within the chaos. I’ve never seen Carlson create something so dark before, but I completely love how he’s able to adapt to new styles on the fly. Tell me what you think of this piece in the comments’ section below. NextAsher’s Podcast Recommendation Part 1 out of ? Thanks for sharing, this artwork is great. Do you have any other art recommendations? Thank you so much! If you like Carlson’s work, I recommend Salvador Dali, Man Ray, Basquiat, and Magritte.